Both Tracing the Tribe and this blog reported on the medieval Jewish cemetery discovered during a construction project in Toledo, Spain. According to JTA, the Spanish government ordered a freeze on the school building project on December 19, following meetings at the Spanish Foreign Ministry with representatives of the Federation of Jewish Communities in Spain, the Conference of Spanish Rabbis, the Conference of European Rabbis and the Committee for the Preservation of Jewish Cemeteries in Europe (CPJCE). More than 100 graves have been exhumed from the building site, an expansion of a nearby state school, according to Rabbi Abraham Ginsburg, executive director of the Committee for the Preservation of Jewish Cemeteries in Europe. Toledo regional authorities are currently storing more than 100 skeletons in separate boxes, Ginsburg told JTA Thursday. ‘At present our main aim is to ensure that no further desecration is taking place and we are committed by Jewish law and tradition to ensure that those graves are being preserved in their sanctified and dignified manner in perpetuity,’ Ginsburg said. The freeze will last until January 15, 2009, although a scheduled January 12 meeting in Toledo will see Jewish organizations requesting that the freeze be extended until the matter is resolved. A rabbinic board is consulting with international rabbinic courts to determine what can be done according to Jewish law. There are many intact graves inside the 13th century cemetery. The City History Museum of Barcelona will host a two-day conference - Archaelogical Intervention on Historical Necropolises: Jewish Cemeteries - on January 15-16, 2009. Considering the current controversy about the medieval Jewish cemetery in Toledo, this is a timely topic. The museum's mission "is the reassessment of the historic heritage of Barcelona, whether the items are movable or immovable. In other words, the museum is responsible for the conservation, research, and dissemination of the objects and buildings that are significant for our collective history and that exemplify the city's past... the best city museum is the city itself, and that it is in its streets, squares, and buildings where we can interpret the passage of time and the interaction of the men and women that have made, throughout the centuries, today's Barcelona possible"
The seminar has been organized because artistic, historical and cultural heritage forms an asset which, following its institutional recognition and classification, is safeguarded by the public administrations. This heritage, formed by elements and ensembles which the successive historical legacies have left in a territory,consists of very different types of cultural goods in which the respective collectives as a whole recognise themselves. 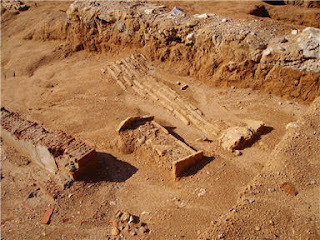 In the case of the medieval Jewish legacy, Barcelona has recently opened the Barcelona Jewish Quarter Information Centre and the city also possesses an important Jewish necropolis on Montjuic hill. These are historical expressions of a period in the city's past when the Jewish community played a highly significant role. The Jewish inheritance is a valuable legacy of Barcelona which is being added progressively to the city's visible heritage. For this reason, before acting on the necropolis of Monjuic, it is appropriate to sediment [sic] the legal and scientific arguments which will allow action to be taken there will all due rigour and the necessary sensitivity. This conference, which is open to all interested persons and which will be welcoming experts and professionals from different places in the world, proposes to analyze the vicissitudes experienced in other actions on Jewish necropolises, and then to approach the case of Barcelona from the legal and scientific standpoints. While there is a need for such forums throughout Spain to discuss issues related to documentation, protection, preservation and presentation of Jewish heritage, I fear, however, that the views expressed by the invited experts may not reflect a representative sample of opinion. The very wording of the statement of purpose of the seminar, which sets out to examine the question of the Barcelona Jewish cemetery from a "legal and scientific" standpoints suggests that others approaches - religious, ethical, moral, historical and cultural - may get short shrift. I hope not. These approaches need to be considered as part of archaeology, too. The seminar will prsent distinguished speakers, although the majority are by archaelogists - some of whom are on record as being dissatisfied with resolutions where human remains from medieval cemeteries have been re-interred, or those in the field of heritage site management. There is no presentation of Jewish law or tradition from a scholar or authority on Jewish burial practices to provide appropriate balance. To read much more about the conference, my views and concerns covering religious aspects and other related Jewish cemetery issues, click here. The Historical Marker Database provides images of markers concerning the Jewish cemetery in Savannah, Georgia. Established by Mordecai Sheftall on August 2, 1773 from lands granted him in 1762 by King George III as a parcel of land that "shall be, and "forever remain, to and for the use and purpose of a Place of Burial for all persons whatever professing the Jewish Religion. During the ill fated attempt of the French forces under Admiral Charles Henri, Comte d'Estaing, and the American forces under General Benjamin Lincoln, to recapture Savannah from the British, General Lincoln's Orders of the Day of October 8, 1779 stated that "The second place of rallying, or the first if the redoubt should not be carried, will be at the Jew's burying ground, where the reserve will be placed." According to the account of Captain Antoine-Francoise Terance O'Conner, a military engineer serving with the French forces, on October 9, 1779, shortly after 4:00 A. M. "The reserve corps, commanded by M. le Vicomte de Noailles, advanced as far as an old Jewish cemetery, and we placed on its right and a little to the rear the four 4-pounders." See the link above for other markers and more information. 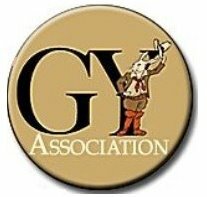 The Jewish Cemetery Association of Massachusetts now has a blog, begun in November. The site does not appear to be very active (10 postings in November, only 1 in December), but there are some interesting items there. Are your ancestors resting at a Massachusetts Jewish cemetery? What does that cemetery mean to you? What are some of your memories about those resting there? 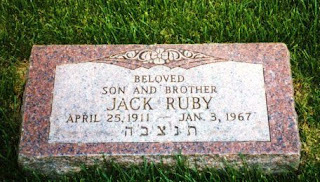 This category is intended to introduce you an important contribution related to our Jewish presence in Massachusetts—Jewish cemeteries. Many people are not aware of the significant role that Jewish cemeteries played and still plays in the formation of our vibrant Jewish communities in Massachusetts today. For instance, did you know that the first Jewish cemetery in Massachusetts was established in 1844 in East Boston (Ohabei Shalom Cemetery, see above picture). Did you also know that prior to 1844 Jews were not allowed to be buried in Massachusetts? Click on the above link to read the postings. Click here for the JCAM site with news and announcements pertaining to the state's Jewish cemeteries. Learn about the JCAM's newest edition of "History & Guide: Massachusetts Jewish Cemeteries" as part of their 25th anniversary commemoration. It includes maps and directions to all 209 state Jewish cemeteries and history from 1844. Two young people - Emily and Joe - living in Berlin write the new blog, Briefe und Zeitungen. The first post I discovered was dated December 14. In Berlin itself of course is the largest Jüdischer Friedhof (Jewish cemetery) in Europe, in the northern Weissensee neighborhood. However, Emily and Joe visited the smaller cemetery in Prenzlauer Berg, south of Weissensee, which was in use until the early 20th century. Their photographs are beautiful. The text also mentions some restoration work that appears to have been done. Scrolling down, in the entry dated Friday, December 12, I also found their visit to the Maybachufer Turkish Market recorded in text and colorful photos. This market takes place from 11am-7pm on Tuesdays and Fridays, on the Landwehrkanal between Kottbusser Damm and Hobrechtstrasse. Sarajevo's long and important Jewish history is addressed in this article in the online Balkan Insight. The story concerns the war in Bosnia and the Jewish community, but for this blog, the important focus is the information on the famous Sarajevo cemetery. The author, Denis Dzidic, quotes USHMM researcher Aleksandra Cholewa who is working on a project in Bosnia documenting crimes against Jews during WWII. The Commission for Preservation of National Monuments in Bosnia and Herzegovina reported that five of the eight most significant Jewish monuments were damaged during the three-year seige, 1992-1995. 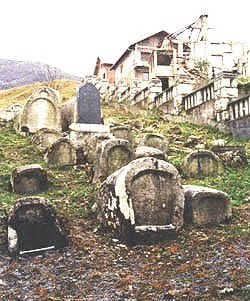 The Sarajevo cemetery on Mount Trebevic in Kovacici is a very famous Sephardic burial site, and was established in 1630 when the land was rented by Rabbi Samuel Baruch. His gravestone existed until the fighting in the 1990s. Unfortunately, the site took direct hits during the fighting. The unusually shaped tombstones (see below) are inscribed in Hebrew and Ladino (Judeo-Spanish). The chief glory of the cemetery was the gravestones, erected in a style found nowhere else expect Spain – the land from which many Bosnian Jews's ancestors came, after being expelled by the ultra-Catholic monarchs, Ferdinand and Isabella. The Commission for Preservation of National Monuments in Bosnia estimates that “about 95 per cent of the stones” were damaged in the war. The Cemetery was also mined, and was not cleared until 1998. Bosnia and Herzegovina was home to some 14,000 Jews before WWII and most of them lived in Sarajevo. Only 4,000 survived and half of them moved to Israel. Today, Sarajevo has about 800 Jewish residents, with smaller numbers in Tuzla, Mostar and Zenica. In the Serbian republic (Republika Srpska), there are some 200 Jews, half in Doboj, the rest in Banja Luka. Since November 2005, Cholewa has collected the oral histories of some 200 Jews in former Yugoslavia. The article also interviewed former residents and detailed their history and escape from the city, how international organizations organized convoys and where the Jewish refugees went. Here's the link to more detailed information about the cemetery from the 2003 report made by the International Survey of Jewish Monuments. For more information on former Yugoslav Jewish cemeteries, see JewishGen's International Cemetery Project here. Click here for more on the Jewish history of Sarajevo. The history of the Jews in Sarajevo can be traced back over 400 years ago when the first Jews arrived in Sarajevo as early as 1541 via Salonika. They were mostly artisans, merchants, pharmacists, and doctors. They built their own quarter, dubbed El Cortijo (the courtyard), in 1577 with permission from the pasha Siavush. The community built a synagogue in El Cortijo in 1580 with the help of a Turkish benefactor, in a building called Velika Avlija. By the end of the 16th century, the building where Velika Avlija stood became known as old Jewish Cathedral, Sarajevo’s first synagogue. Click here for an excellent newsletter article and photos from Hebrew University's Center of Jewish Art's newsletter on former Yugoslav Jewish cemeteries and synagogues titled "Bosnia/Herzegovina and Croatia: Documenting Jewish Art and Architecture." Terry Thornton, creator of the Association of Graveyard Rabbits, and thus the impetus to the founding of the International Jewish Graveyard Rabbit, pointed me to a booklet by Dr. Barnett A. Elzas, rabbi (in 1903) of K.K. Beth Elohim, in Charleston, South Carolina. 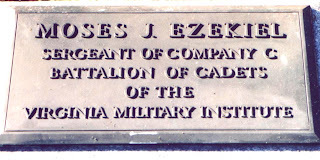 In a private edition of 250 copies, Elzas published the transcriptions found in three old Charleston Jewish cemeteries. Find the downloadable book here. Here's an excerpt from the introduction to "Old Jewish Cemeteries at Charleston, SC: A Transcript of the Inscriptions on Their Tombstones." I have bolded the family names. 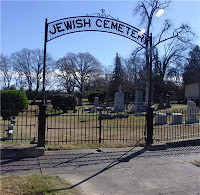 The cemetery at Coming Street is the oldest Jewish cemetery in South Carolina. 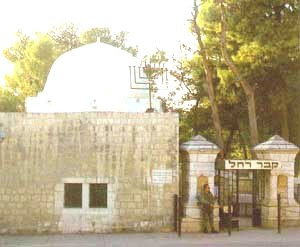 It was originally purchased by Isaac Da Costa, the first Hazan of Beth Elohim, for a private burying place for his own family. "Finding that it would be a convenient place for the Burial Ground of the Jews' Congregation in general," he, "out of regard for the said congregation became willing and desirous, and did afterwards intend that the same should be conveyed in trust to the congregation." Carrying out his original intention. Isaac Da Costa, conveyed this burial ground in 1764, for a consideration of seventy pounds lawful money of the province, in trust to certain trustees" for a place of burial for the use of the Jews residing in Charles Town or elsewhere within the Province of South Carolina, who do and shall conform to the Jewish rites and ceremonies in general, and who do and shall conform to and observe the rules, orders and regulations of the Jews congregation in Charles Town named Beth Eloim." The following are the trustees mentioned in the deed: Joshua Hart, Immanuel Cortissos, Joseph Da Costa and Samuel Da Costa, of Charles Town, and members of the Jews congregation in Charles Town known by the name of Beth Eloim. Benjamin Mendes Da Costa, Joseph Salvador, Esq., Solomon Da Costa, Moses Franco and Joshua Mendes Da Costa, of the city of London, and members of the Portuguese Jews congregation in the said city known by the name of Sahar Ashamaim. Jacob Lopes Torres, Isaac Mendes Furtado. Benjamin Dias Fernandes, Isaac Henriquez and Abraham Aguilar, of the Island of Jamaica, and members of the Jews congregation in King's Town in the said Island, known by the name of Sahar Ashamaim. Isaac Piza, Benjamin Messias, David Castello, David Lindo and Isaac Pinheiro, of the Island of Barbadoes, and members of the Jews congregation in Bridge Town in said Island, by the name of Nidhe Israel. Jacob Franks, Daniel Gomes, Benjamin Gomes, Isaac Mendes Seixas and Heyman Levy, of the city of New York, and members of the Jews congregation in that city known by the name of Schorit Israel. Moses Lopes, Moses Levy, Naphtali Hart, Jacob Rods. Rivera and Aaron Lopes, of New Port, Rhode Island, and members of the Jews congregation in the said Island known by the name of Yeshuat Israel. Benjamin Sheftal, Mordecai Sheftal, Minis Minis, Isaac De Lyon and Levy Sheftal, of the Town of Savannah in the Province of Georgia, and members of the Jews congregation in the said Town of Savannah, known by the name of Mikve Israel. The deed is recorded in the office of Mesne Conveyance, Vol. C 3, p. 108 sq. Those searching Sephardic families will find much information as most of the area's original Jewish settlers were indeed Sephardim. Ashkenazi Jews arrived later. There is a full name index. Reading through the inscriptions, see individuals born in South Carolina, Massachusetts, New York and other current US locations or natives of Curacao, London, Dublin, Amsterdam, Gibraltar, Germany, France, Prussia, Bavaria, Italy, Poland and elsewhere. Tablets on cemetery walls are in memoriam to relatives who died elsewhere. The deceased died as infants, assassinated on a journey, of yellow fever, in swimming accidents, in shipwrecks, or as Civil War soldiers. Others enjoyed full long lives into their 80s. A native of the State of New York and for the last sixty years a resident of this city, who departed this life on the 16th. day of the month Tammuz, in the year 5595 of the Creation, corresponding to the 13th. July 1835, aged 81 years, 11 months, and 14 days. The deceased served as a Subaltern Officer in the militia of South Carolina during a great part of the Revolution, until made a prisoner of war in 1780. He was also attached to the Forlorn Hope when the line* of Savannah were attacked by the combined forces of Gen. Lincoln and Count de Estaing. As the deceased was an example of patriotism, so in private life he was a model of the domestic virtues, of a sound judgment and well cultivated mind. His career through life was marked by the esteem and respect, and his end by the sincere regret of numerous friends and connexions. Elzas wrote four additional booklets detailing other South Carolina Jewish cemeteries (names and links below). Find all of them, in a variety of downloadable formats, on the American Libraries site. Topics include the cemeteries at Georgetown, Orangeburg, Charleston (Brith Shalom and Beth Elohim), as well as the transcription edition. "The Jewish cemetery at Georgetown is the second oldest Jewish cemetery in South Carolina, and contains a number of inscriptions of historical interest. I have not been able to trace its history owing to the fact that the records in Georgetown prior to the War are no longer in existence." "This Cemetery, the property of the Hebrew Benevolent Society, of Orangeburg, was purchased in 1886." "This [General] Cemetery, situated near Magnolia Cemetery, at Charleston, S. C, has been in use since 1856. The inscriptions on its tombstones will furnish the best guide to the various strata of Russian and Polish immigration of the Jewish element in the population of Charleston, S. C, which to-day numerically far outnumbers the remnants of the older elements. 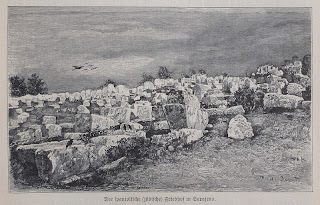 "The cemetery at St. Andrew's Parish: This cemetery, now belonging to the Congregation Berith Shalome, formerly belonged to ''Hevry Bikur Holini," Amalgamated Aug. 27, 1897. It comprises "one acre on Sycamore Avenue, Hillsborough Plantation, in St. Andrew's Parish, Berkeley Coimty, originally conveyed to Hevry Bikur Holim by Deed dated Jan. 7, 1887, and recorded in the Mesne Conveyance Office for Berkeley County, Book A No. 3, p. 220." "The New Jewish Cemetery of K.K. Beth Elohim, Charleston, SC: The modern cemetery of the Congregation Beth Elohim, situated on Huguenin Avenue, was purchased in 1887. It replaced an older cemetery at Rickersville, from which all the bodies were removed to the present site." Note for international readers: I often learn about resources on Google Books. However, as my computer is identified as located outside the US, I am limited in what I can view due to certain restrictions. American Libraries is an excellent alternative and I generally have no problem downloading or viewing the same sources. Why visit a Jewish cemetery? - It's free. No entrance fee (at least for the living). - It's open 24-hours a day (except Shabbat and Holy Days). - Residents are always at home. - Talk all you want; no one will argue with you. - Always meet new people and learn something new. - Stories don’t change according to who tells them. - It's quiet, calm, and if you talk, no one will shush you. - Did I mention entrance is free? - Addresses don’t change, people just get new neighbors. - Every city has one (or more). - No grandma is going to stuff you with food. - Come empty-handed - no one will complain. Do you have your own reasons? We'd love to hear from Rabbit's readers - so just write a comment! This week, we read the Torah portion וישלך Vayishlach, Genesis 32:4-36:43 throughout the Jewish world. In this text, we read about the death and burial of our Biblical Matriarch Rachel. She dies while giving birth to Benjamin, and is buried by her grieving husband Jacob. In Genesis 35:20, Jacob buries her and sets up a pillar over her grave. 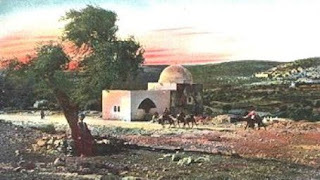 It is located on the northern entrance of Bethlehem, adjacent to the neighborhood of Gilo. Rachel’s tomb has been mentioned by Jewish travelers since about 1300 CE. The actual tomb consists of a rock with 11 stones; one for each of the sons of Jacob. Over the centuries, the rock was covered by a dome supported by four arches. In 1841, Sir Moses Montefiore was granted permission by the occupying Ottoman Turkish empire to restore the tomb. He funded the construction of the large two room building seen today. This Biblical cairn or pile of stones was a precursor of today’s more familiar markers. It continues to be the Jewish custom to mark a grave with a monument. The dedication or unveiling of a grave stone is a custom that can be held anytime after the Shloshim (30 day mourning period). Sephardi Jews commonly dedicate the stone soon after the conclusion of the Shloshim, which is also the custom of many Ashkenazi Jews in Israel. The European Jewish Press reported on the newly appointed Chief Rabbi of the Netherlands, Rabbi Binyamin Jacobs. Another issue Rabbi Jacobs wants to raise is the restoration and maintenance of Jewish cemeteries dispersed throughout Holland. These cemeteries were first created as early as in the 17th century when Jews settled in Holland, mostly escaping oppression and inquisition from the Iberian Peninsula. The rabbi believes that the Dutch government ought to participate in the funding of the preservation and maintenance of these cemeteries because of their special historical value. Rabbi Jacobs is one of the Netherlands' veteran rabbis and a member of the Rabbinical Centre of Europe (RCE), the prominent rabbinical body. He's the first to serve in this position since 1986. Philadelphia's Jewish Exponent mentioned Curacao's Jewish cemeteries (and photographs) in its latest travel article by Rita Charleston. Jewish heritage is evident in Curaçao, home of the oldest synagogue in continuous use in the Western hemisphere. Founded in 1651, Sephardic Congregation Mikve Israel is now called Mikve Israel-Emanuel after a 1964 merger. The beautifully constructed, two-story, yellow-colored building is particularly inviting. Step inside and onto a soft white-sand floor. Our tour guide said the sand symbolizes the 40 years the Jewish people spent wandering in the Sinai Desert after they fled from Egypt. Other people say the tradition dates from the Inquisition, when synagogues in Spain and Portugal were covered with sand to muffle the footsteps of Jews worshipping in secret. If you visit the island, see the Jewish Cultural Historical Museum. In the courtyard are replicas of some of the beautiful headstones from the cemetery, Beit Haim Blenheim, which includes as many as 5,500 burials. The Jewish Quarter of "Scharloo" may also be of interest. Read the complete article for more information at the link above. Guess who's buried in a Jewish cemetery? In this series of life’s surprises, I will begin to offer an intriguing array of celebrities and the infamous who are buried in Jewish cemeteries! Who can forget where they were on November 22, 1963 when Lee Harvey Oswald assassinated President John F. Kennedy? A more difficult task may be trying to remember who you were with two days later when Lee Harvey Oswald himself was killed by Jack Ruby. 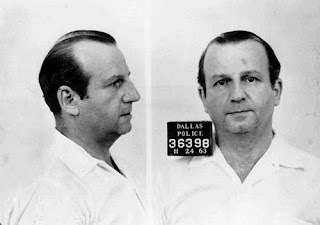 Live on TV that Sunday morning in a Dallas police station, Jack Ruby certainly killed the presidential assassin - and, yes, he was in fact a member of our tribe. At the bottom of the marker is the Hebrew acronym found on many Jewish graves, TAV NUN TZADI BET HEY, translated as, “May His Soul be Bound into the Bonds of Life Eternal.” Even a convicted murderer is given a blessing at his death! The fine folks at http://www.findagrave.com/ will even show you the plot number and gps coordinates. 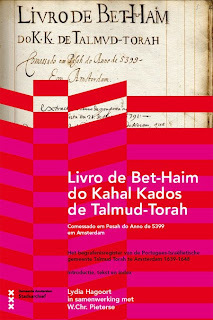 The Municipal Archives of Amsterdam has published the "Burial Register of the Portuguese-Israelite-Municipality Talmud Torah in Amsterdam, 1639-1648" (Comessado em Pesah do Anno 5399 em Amsterdam, in Portuguese). Introduction, text and index: Lydia Hagoort, with W.Chr. Pieterse. This transcription is the first both printed and digital book by Amsterdam's Municipal Archives. The download is free. The website is in Dutch, as is the information about the register. With a smattering of languages, I got through a quick overview, but I know missed many important details. However, as in most genealogical books, lists of names are not dependent on language. A name is a name, and this register is a goldmine if you are searching Sephardic names. The homepage links to an article about the register, and in the article is the download link for the book, which text is mostly in Portuguese with some Hebrew. Other portions are in Dutch. Entries offer data concerning each burial: name, family relation, burial date and a list of people attending the burial with indications of the amount they paid - I am not sure if these figures were as contributions to a particular burial or as general donations to the cemetery. Sometimes the family relationship is mentioned: son, grandson or uncle of the deceased. Data includes Jewish and/or secular dates. There are also lists of people who paid for burials or for gravestones. Annual expense accountings are included. An earlier burial register over the years 1615-1630, was published previously: Livro de Bet Haim do Kahal Kados de bet Yahacob (1970, original text), by Wilhelmina C. Pieterse. The next register, beginning in 1680, has not yet been published. First names also offer variations. For example, Jacob may be listed as Yahacob, Yacob, Jacob, Jaquo, Yaquo and others. There is a glossary of Hebrew terms, with explanations in Dutch. A bibliography of useful texts is on page 10, and the cross-referenced Name Register starts on page 198. The introduction reveals there are some 165 hand-written pages in the original. For a very detailed article (in Dutch) about the 1614-1943 Jewish community archives, click here. The book is available free for download at the links above. David Semmel writes the Jewish Prezemysl Blog, which is devoted to the descendants who are researching and remembering 700 years of Jewish life in the town. A recent post details work on the cemetery project, and a plea for funds to continue preservation and restoration work at the Slowackiego Street Cemetery, spearheaded by Dr. John Hartman, who leads The Remembrance & Reconciliation Foundation. Anyone who has been to the site ten years ago and recently can testify as to the progress - and the amount of work that remains. We wage a constant battle against the elements in the form of yearly maintenance and repair. In general, the winters in Przemysl are harsh and combined with the hilly topography of the site, there is constant and serious erosion in many places. In addition, there was a windstorm recently that downed several trees, requiring an unplanned, emergency clean-up. We are lucky to employ one of the very few Jews left in the town, Mr. Jocaim Glettner, a mason by trade, as the general contractor/overseer. Paying him, and just keeping up with maintenance usually costs $5,000/year – but over $8,000 this year as the dollar tanked. Hartman and Semmel together raise about two-thirds of the funds which are mostly used for current upkeep with no funds for restoration or other projects. Prezemysl descendants may be interested in remembering their ancestors by contributing to star plaques commemorating mass-murder victims ($100 each); Jewish historical plaques for the cemetery wall ($500 each); construction of a walkway between the two mass-murder monuments ($7,500); and the clearing of walks and access paths in the cemetery's older sections ($1,000) . The Foundation is a tax-exempt, non-profit 501(c)3 organization and contributions are used only for projects in Poland. See the Foundation link above to make donations, or obtain more information. Contact Semmel through his blog and Hartman through the Foundation. 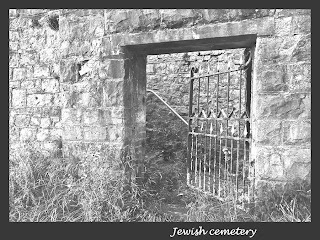 On a photo site, I found an image of the old Jewish cemetery in Merthyr Tydfil. According to the photographer, it is one of the largest Jewish cemeteries in South Wales. Here's the entrance to the cemetery. The site was purchased in the 1860s, with the first burial in 1867 and others in 1872. there is a poem recited by Grahame Davies, with a link to the full text and recording. The English-language Budapest Times posted an article and photographs about the Jewish cemetery in Tinnye, some 35 km northwest of Budapest. The village of Tinnye, located around 35 km northwest of Budapest, has just 1,350 residents. Earlier Tinnye was a popular trading spot: roads from Buda, Esztergom and Székesfehérvár intersected here, and there were wealthy noble families as well as a bustling marketplace. The livelier a place has been, the more present death is. Tinnye has eight cemeteries. The story, by Astrid Stangl, focuses on Eszter Toth, a German school teacher in Piliscsaba, who has been researching the area's history, including Tinnye's cemeteries. Her work is now on display at Budapest's Museum of Ethnography. It mentions burial sites for the town's nobility, upper middle class and the Roman Catholic majority population, although Toth says that, in the old reformed Dióstemető (Walnut) cemetery, it was the custom to place gravestones at the foot of the grave instead of the head, as is common today. The Roman Catholics placed simple wooden crosses, and metal ones produced in the adjacent village of Piliscsaba are also seen. People were forbidden from entering the cemetery of the cholera victims to stop the disease from spreading. The cemetery was surrounded by dense lilac bushes and acacia trees. Melancholy poems and inscriptions can be read on the 35 gravestones that remain. Next to the inscriptions broken off twigs can be seen as symbols of lives that ended far too young. Tóth’s photographs of Tinnye’s cemeteries are on display through February 22, 2009 at the Musueum of Ethnography. The site is in Hungarian. I found some photos of some of the cemeteries, but none of the Jewish one. 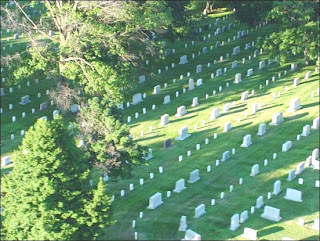 Marlene Bishow of the Jewish Genealogy Society of Greater Washington (JGSGW) has provided information on new records added to the group's website for the "Ken Poch Index of Jews Buried in Arlington National Cemetery." Bishow is the group's immediate past president, current ANC project manager, and will co-chair the 31st IAJGS International Conference on Jewish Genealogy in Washington, DC. Self-proclaimed historian of Jews buried in ANC, Kenneth Poch began the project more than 10 years before his 2003 death. His family donated 12 boxes of his work to the JGSGW. Based on that research, webmaster Ernie Fine developed the website with a Steve Morse-model search engine. Currently, there are more than 2,600 entries; an additional 600 will go online in January 2009. More than 2,000 gravemarkers photos (taken by Poch) have been scanned by volunteers and will be added with links to view them online, and new photos will also be added. Genealogical data is being added to the database using Poch's data and that of the group's volunteers. Visitors to the website are encouraged to submit names and additional information about Jews buried in ANC. For the present, the search is limited to the names of the interred. Here (above) is the monument for sculptor Moses J. Ezekiel. For more information, click here. To submit information, follow contact page directions. 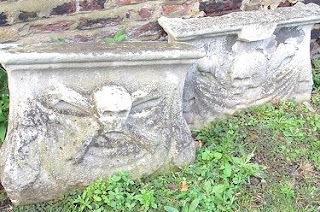 Although I am certainly no expert on Jewish tombstone symbols, I must comment on the caption in the Jamaica cemetery section of this blog which implies that the skull and crossbones are symbols for a Jewish pirate's grave. I recently was lucky enough to visit the site of the oldest Jewish cemetery in England in the grounds of Queen Mary's College, Mile End in the East End of London. Here are some photographs I took on my visit. 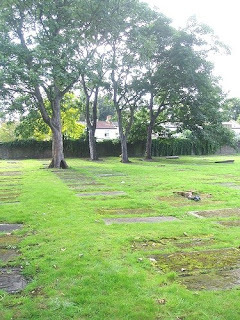 It is now hemmed in by buildings on two sides and has little to show of its former status as the graves were horizontal and are mostly now completely covered by turf and unreadable (left below). There are a few other remains stacked by the perimeter wall, all having skull and crossbones on them (see below). The cemetery still has a very special feel and is very peaceful - a haven in the bustling and rather delapidated Mile End. 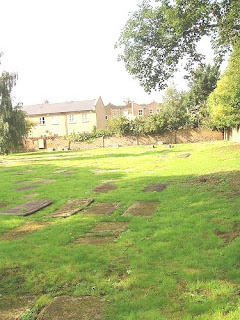 The Old Velho Sephardi Cemetery, as it is known, was created just over 350 years ago on the orders of the Lord Protector, Oliver Cromwell, who, overruling his own council, officially readmitted Jews to England for the first time since their expulsion in 1290. It was opened in 1657 and closed in 1742. It was the first Jewish cemetery to be opened following the readmission of Jews to this country under Oliver Cromwell. A particular feature of Sephardi cemeteries are the flat tombstones which I am told symbolize that all are equal in death - rich or poor, high or low. 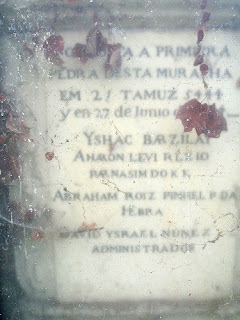 Abraham Fernandez Carvajal, the founder of the modern Anglo-Jewish community, is buried in the old Velho cemetery as as well as Haham David Nieto, one of the greatest Sephardic spiritual leaders (born Venice 1654 - died London, January 10, 1728) and the physician Dr. Fernando Mendes. This interesting article discusses the background of Carvajal and the early Sephardim in London; read here about David Nieto. Above right, see an image of the decaying wall plaque listing leaders of the community. Surely the skull and cross bones in a universal symbol for death and fleeting nature of life and has nothing to do with pirates who could not have lived and flourished in Mile End in the 1600s? Philly 2009: Website live, Call for Papers open! The website - Philly2009.org - and the important Call for Papers for the 29th IAJGS International Conference on Jewish Genealogy is now up and running. More information is sure to be added rapidly. Mark your calendars, check for plane and train tickets, for what will be an excellent conference hosted by the JGS of Greater Philadelphia and the IAJGS at Philly's Sheraton Center City Hotel from August 2-7, 2009. The proposal submittal deadline is January 15, 2009, with acceptance notification by February 28, 2009. Program co-chairs are the well-known Mark Halpern and Mark Heckman. Encouraged are presentations and workshops providing practical research methodologies that will help conference participants in their research. Highly original topics will be given special consideration. Presentations and panel discussions are 75 minutes including 15 minutes Q&A; workshops are 2 hours long. Speakers may submit any number of proposals. Sole speakers with at least one accepted proposal will receive complimentary conference registration. Speakers sharing accepted proposals will receive partial registration fee waivers. Speakers are required to provide handout material for each presentation to be included in the syllabus distributed to all Conference registrants. All materials must be uploaded using the Conference website. Letters of acceptance will provide more details. Ok, genners, time to get cracking on readying your programs. The Jewish Graveyard Rabbit recently posted about the ancient Jewish Cemetery in Toledo, Spain that was threatened by a school expansion project. Rabbit has learned that a demonstration was called today in Tel Aviv, Israel in front of the Embassy of Spain at 5 Dubnow Street. 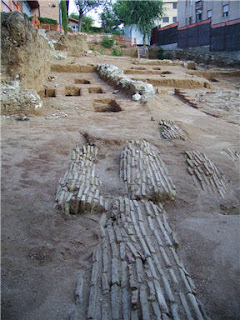 Rabbit also received photographs of the Toledo site, which appear here. For more information, click here for the Zakhor Center of Studies in Barcelona which is spearheading the fight to save the site. Late in September the expansion of a school in Toledo caused the excavation of the ancient Jewish cemetery prior construction starts. This school and the residential complex built in the 80's, already destroyed a great part of the cemetery. Today, besides two synagogues (of the 10 that existed at the time) which can be visited today as Museums, the ancient cemetery is the only other landmark which remains of the Jewish community which once lived there. This community certainly deserves respect for their tradition and beliefs.